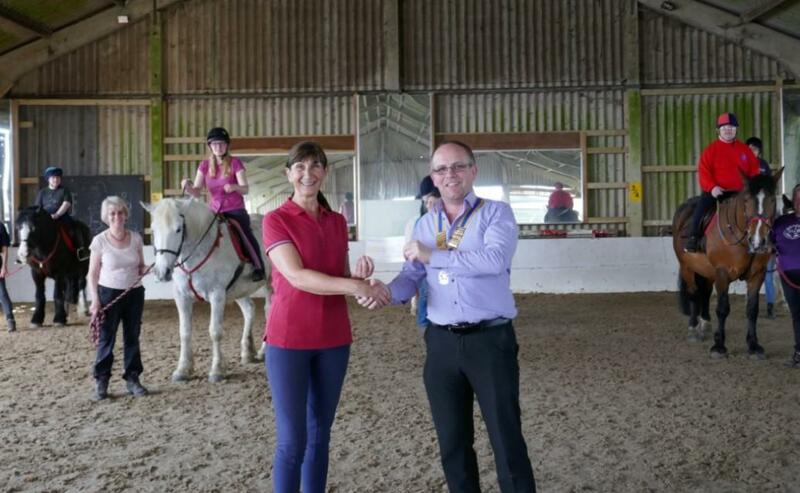 Julie Mace, Secretary of Rawreth RDA, explained that the therapeutic benefits of riding for disabled people are numerous and as well as the physical benefits of improving posture, becoming stronger and helping riders to become more supple, exercising with a horse can provide great fun! It can improve awareness, communication, confidence and decision making and provides an opportunity to enjoy activities with a community of like-minded people. Rawreth RDA provide 6 riding sessions for the disabled each week and, although the majority of the work is done by volunteers, the charity incurs considerable running expenses. President of the Rotary Club of Rayleigh Mill, Carl Watson, was impressed with the dedication of the volunteers and with the obvious enjoyment of the riders and was pleased to be able to present Mrs Mace with a cheque for £250.